• If you could go back to any time in history, where would you go? • What movie title best describes your life? • Where is your dream vacation spot? • Do you collect anything? • If you won a million dollars, what would you do with it? • Is there a song that makes you cringe? • What weird food combinations do you really enjoy? • What’s your pet peeve? • Favorite show to binge-watch? • Do you have a pet? If so, share a photo. Another AgCareers.com structured activity was our holiday gift exchange, coordinated through Elfster. With a little wish list magic, online shopping, and shipping, employees that chose to participate opened their gifts live during our video staff meeting. Email is, of course, vital with off-site employees, but instant messaging brings employees closer together with the opportunity for quick responses, or just a simple chat. You can’t stop by their office to say howdy, but messaging is the next best thing! Regular meetings via phone are acceptable, but video conferencing is ideal for a team spread out around the country, or even the world. Connect via Skype, Go to, Teams or other conferencing services where you can hear AND see team members, and even share files live. Nothing can replace real face-to-face meetings. 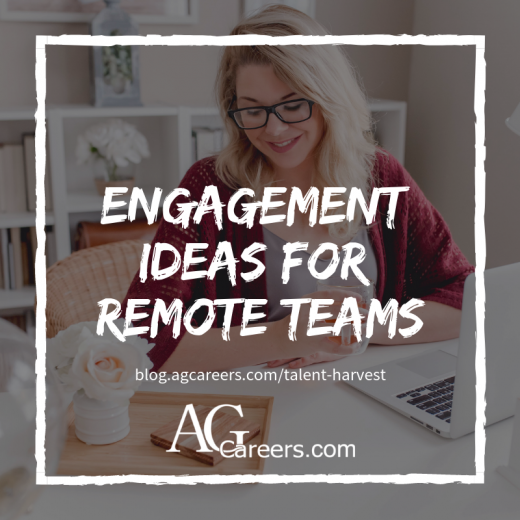 Bring remote employees into an office periodically or meet in a neutral (or fun) location for staff meetings or retreats. Sometimes this personal interaction is all that is needed to reconnect, and recharge disconnected employees. The majority of agribusinesses tell us they measure employee satisfaction and engagement, most often through an internal survey conducted yearly. Ask your employees! Do they feel engaged? Invested in the business? Connected to their coworkers? For more ideas, check out our Talent Engagement Blogs.